Building a pocket sized media center (HTPC) using Arch Linux, Kodi and a Raspberry Pi 3. I finally got around to doing it and I'm delighted with the outcome. Kodi and the Raspberry Pi together make a cheap yet useful media center solution. Kodi is an open source media center application with a polished interface that will rival any commercial product. Combine it with the tiny form factor of the Raspberry Pi, and the end result is an unobtrusive device that packs a powerful entertainment punch. Quite a few OS options are available for the Pi, I settled on Arch Linux. It is lightweight and highly customizable. Packages are always up to date thanks to rolling releases and the wiki provides excellent documentation. 1 x Raspberry Pi 3 Model B has plenty of grunt to run Kodi hassle free. Networking is provided by the built in WIFI. 1 x Extreme MicroSD with high read / write speed for optimal performance. A small size (8GB) will work well since it only needs to contain a lightweight OS and the Kodi application. Digital content can be served off an external file server (NAS) or streamed over the internet. 1 x Micro SD Card Reader / Writer, used to write to base operating system image. Optionally a case for the Raspberry Pi. The instructions for installing Arch linux on a Raspberry Pi relies on linux command line tools. OSX users can get around this limitation by using Vagrant, VirtualBox and the VirtualBox Extension Pack. Kodi-dev is a Vagrant project that will create an Arch linux Virtual Machine (VM) with all the required tools installed. Additionally it contains an installation of Kodi that can be used for add-on development, but more on that in a later post. Note that Vagrant 1.8.7 for OSX has a bug with the packaged curl binary. The suggested workaround, if vagrant up does not download the box file, is to symlink the system curl: sudo ln -nsf /usr/bin/curl /opt/vagrant/embedded/bin/curl. Once vagrant up completes, you should be presented with a fresh installation of Kodi. Identify the SD Card Writer from the output of lsusb. Not seeing it? Make sure that its properly plugged into the USB port and that the SD Card is inserted. The next step is to determine the device that Arch will be installed on. Output will vary depending on whether the SD Card has partitions. Identify the device by matching it with the size of the SD Card, sdb in this example. Still unsure?, unplug the Card Writer and see which device disappears when you rerun lsblk. Now follow the installation instructions provided by Arch linux, that has been duplicated and condensed below. At this point the Pi can boot off the SD Card. Connect it to a monitor or TV and power it up, you should see a linux terminal login screen (Username & password is alarm). The remaining installation instructions need to be executed on the Pi, either via a direct terminal or SSH. The wifi-menu tool can be used to get the Pi connected. After completing the wifi-menu setup wizard the wlan0 interface should be up. Finally ensure that Arch will connect to the Wi-Fi network at boot time. The next step is to install Kodi and configure it to start on boot. Additionally bumping the gpu_mem to 128MB also produces a smoother UI experience. This section will cover how to install OpenVPN as a systemd service and control it through a Kodi addon. To make use of OpenVPN you need to purchase a subscription from an OpenVPN provider. Providers will have a set of OpenVPN configuration files, one for each exit node they provide. Download the configuration files into /etc/openvpn. Usually the provider will require a username and password to connect to their service. To automatically provide these credentials, it needs to be stored in a file and linked in every *.ovpn config file. Symlink one of the exit node configurations to /etc/openvpn/client.conf, this is the configuration systemd will use. At this point all network traffic will go through the configured VPN connection. To change the exit node of the VPN connection manually, symlink the desired configuration file to /etc/openvpn/client.conf and restart the systemd service. (systemctl restart openvpn@client). 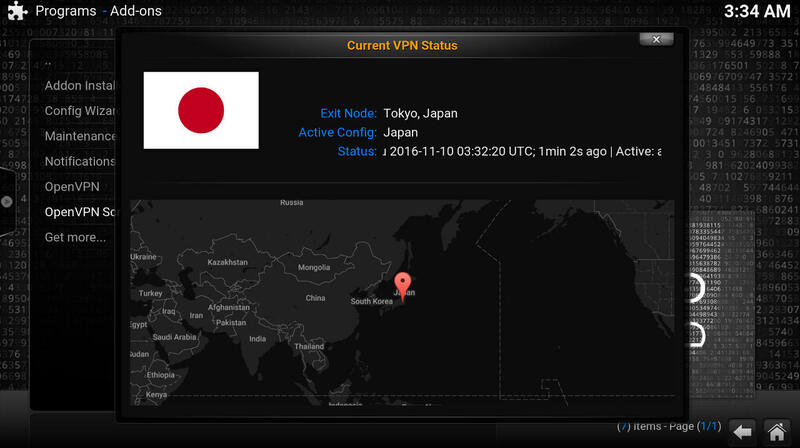 The OpenVPN addon allows Kodi to control the VPN connection, however it requires certain sudo privileges. Apply the following changes to the sudoers file. The addon is part of the kodi-monkey-repo repository. Download the repo zip file and place it in the Kodi home folder. Then follow the official Kodi instructions to install a repo from a zip file.